Hanoi (VNA) – The Vietnam National Shipping Lines (Vinalines) and Belgian Rent-A-Port N.V signed a Memorandum of Understanding (MoU) on August 30 on the possibility to cooperate in grain specialised port, processing zone and logistics system projects in Lach Huyen port and Dinh Vu industrial zone, in Hai Phong city. Rent-A-Port is an engineering and investment company, specialised in the development of marine infrastructures and industrial zones worldwide. It offers services ranging from consultancy and full project management to co-investment in marine related projects and industrial zones. Under the MoU, the two companies will seek collaboration opportunities in a joint venture company to develop grain handling port in Hai Phong International Gateway Port. They are also keen on another joint venture firm to construct a 250 hectare logistic centre opposite the grain port, facilitating grain loading, storage, processing and distributing. Along with joining the construction of a 630-metre port in Dinh Vu industrial park, which is currently invested by Vinalines Dinh Vu JSC, the Belgian enterprise can buy 10 percent of Vinalines’s charter capital when the company becomes privatised in April, 2018. Thus, Rent-A-Port N.V will attach its long-term benefits to Vinalines as well as support the Vietnamese company in advanced technology transfer, human resources training, financial capacity improvement, business management, service supply and market development. 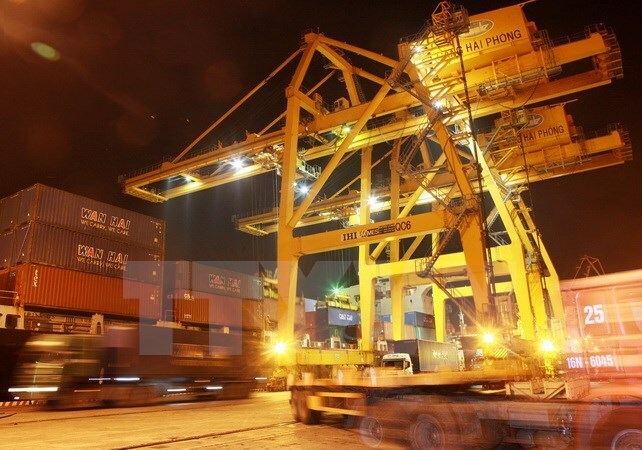 With adorable port infrastructure and logistic system coupled with considerable management experience and financial capacity, collaboration between the two enterprises is expected to enhance competitiveness and maintain crucial roles of both sides in marine port and logistic sectors in Vietnam. Vinalines is a leading marine business in Vietnam, especially in port and marine services in Hai Phong city. The firm will make an initial public offering (IPO) in December this year. Under the IPO plan, the State will hold 65 percent of the company’s registered capital of 12.3 trillion VND (541.2 million USD) while it will sell 35 percent to domestic and foreign businesses. Vinalines is also allowed to hold 65 percent of registered capital at key ports, including Hai Phong, Sai Gon and Da Nang.